Earlier this month my friend Stephanie ran her first 5k race and I was able to run it with her! You never forget your first race and I was really excited for and proud of her for running her first one. 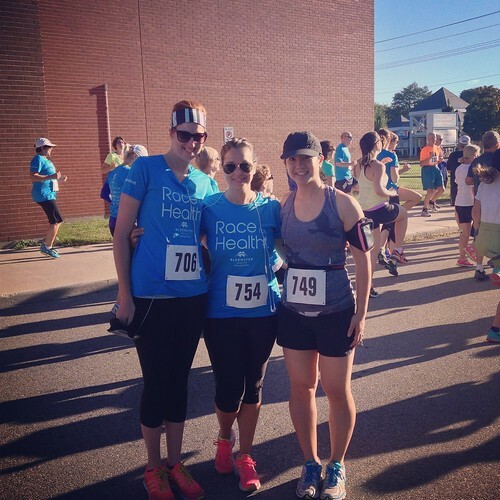 Janine, Stephanie and I before the Race for Health in Sarnia. 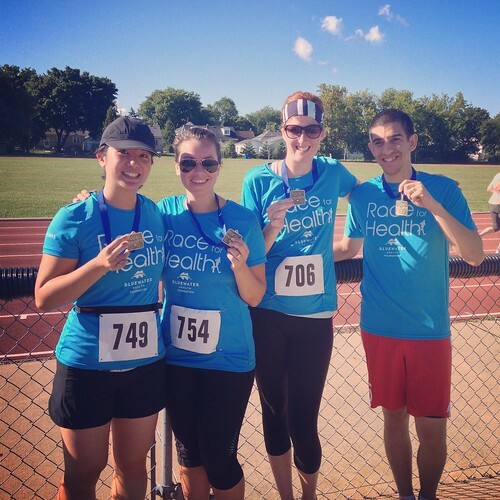 We ran the Race for Health in Sarnia, with proceeds supporting the local hospital. It was the first year that they had organized a race so the field was small, but very well organized. They had a 5k, 10k and half marathon option, which included chip timed results and medals for all finishers. Steph’s sister-in-law Janine and her cousin’s husband Pete also ran the race. The night before, we went to Cosmo’s Restaurant in Sarnia for dinner. My friends weren’t kidding about the amount of food they give you! Everybody received a giant bun with their meal (absolutely delicious) and I ordered pasta with their homemade marinara sauce with mushrooms and green peppers. Dan had their lasagne. I don’t really remember what his food looked like because I blinked and it was gone. He wolfed it down. This was the perfect meal for the night before a race and we had plenty of leftovers to take home with us. At dinner we all discussed our goals for the race. Pete’s goal was to finish in 24 minutes or less while Janine was aiming to finish in 28 minutes. Steph’s goal was to finish since she had made it to a little under 4k in her training, but still hadn’t run a full 5k yet. I told her not to worry since the adrenaline would carry her for the last kilometre. Also, one of the advantages of a first race is that any finish time is guaranteed to be a personal best! 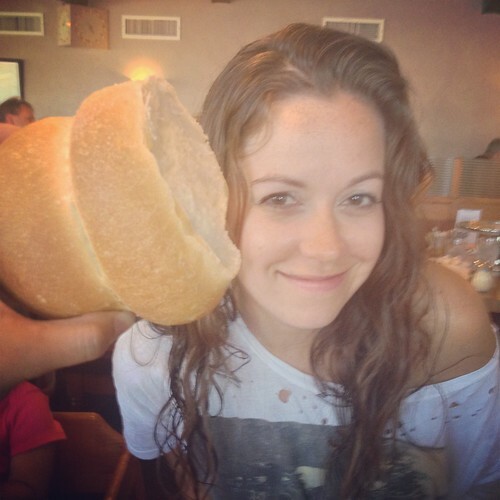 The bread at Cosmo’s was the size of Steph’s head! It was delicious. 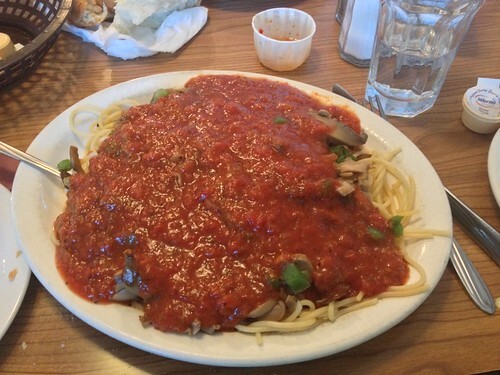 I had spaghetti with their marinara sauce, mushrooms and green peppers. It was delicious. It also came with a huge garden salad (not pictured). Most of this pasta went home with me. The next day we were up bright and early. I could tell Steph was nervous about the race, which I totally understand. Even though I’ve run dozens of races I still get nervous! I can also remember how I felt when I first started running. I could barely sleep the night before my first race (the Bay to Breakers 12k race), my first half marathon and my first marathon. Steph’s husband Jamie made Dan and I some oatmeal for breakfast while Steph had a fried egg and some toast. I kept telling their daughter Madison to practice cheering by saying “Yay mommy yay!” but she kept saying “Yay daddy yay!” I told her we’d work on it. It was perfect weather for a run. There were blue skies and sunshine and it was already 16C when we got to the start. The race ended on the track that Steph used to run on when she was in high school, so things were coming full circle for her. We took the time to walk around the track and warm up. Soon we were lining up at the start line. 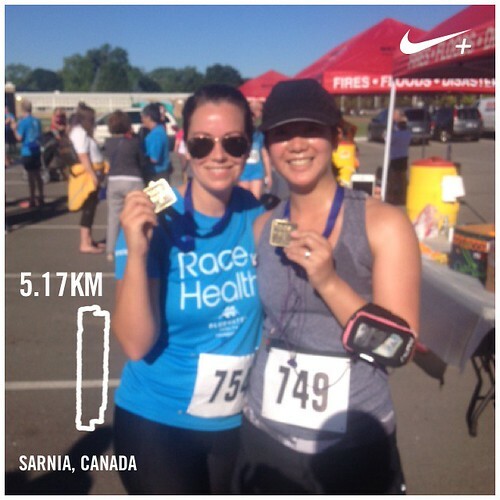 I was a little bit nervous about the course because I don’t know Sarnia at all and they didn’t close the roads. They didn’t close the roads for the Hypothermic Half that I ran there in February, which had made it more challenging with the snow. This time it was no problem. I ran with Steph and the course was well marked so we didn’t get lost. The course also took us through some areas with lots of shade, which made it a more comfortable run. Steph had trained for the race by mixing running with walking breaks. She told me that she wanted to try running for 20 minutes straight before taking a walking break. 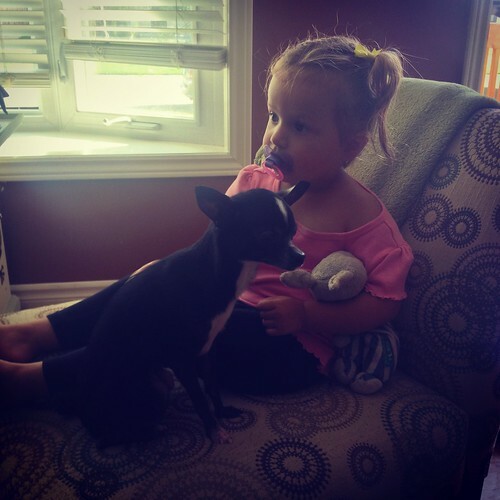 Twenty minutes came and went and she still wanted to keep running. When we got to the water station at about 3k in I asked her if she wanted to walk at the water station. She thought about it for a moment and decided to keep going. When we hit 4k Steph announced to me that it was the longest distance she’d ever run and also the fastest! I was so proud of her. As we were getting closer to the finish line she also started to pick up speed! It was good to see that she still had more to give in the last few metres. I remember feeling like I was going to die at the end of my first races, so this was a nice change! When we hit the track for the last few metres we picked up speed and crossed the finish line together. It was exciting to see our husbands at the finish line and Madison cheering “Yay mommy yay!” for Steph. Steph and I after the race. After the race we collected our medals, got some food and took more pictures. Janine had a stitch in her side during the race so had to stop and stretch it out. She was able to recover and still finished in 32 minutes. Considering that she’s also fairly new to running I thought that was a pretty good time. It’s always hard to have to recover from cramps and mishaps on race day. Meanwhile Pete finished in 22 minutes and placed third overall. We were all pretty happy with the race and I was proud of Steph who ran the whole thing. You never forget your first race, and although my first races are over, it was nice to get to experience this with her. I will certainly never forget her first race! Me, Steph, Janine and Pete with our medals and t-shirts. What a great race day! Congrats to Steph. I hope she’s now hooked. Funny coincidence, but Bay to Breakers was my first race too.